Home >> Providers >> Anu Gulati, M.D. Dr. Anu Gulati completed her Family Medicine Residency at Michigan State University in 2006 and joined North Atlanta Primary Care in 2014 and is seeing patients at our Johns Creek location. She is a graduate from Rangaraya Medical College (NTR University of Health Sciences) in India and also has a Masters Degree in Public Health (MPH) from Western Kentucky University. She has been practicing in Metro Atlanta area for 8 years before joining NAPC. Dr. Gulati manages all aspects of outpatient care including acute and chronic medical problem management such as diabetes, hypertension, hyperlipidemia, annual physical exams and sports physical exams. She specializes in preventive health care and women’s health services. Dr. Gulati is a professional member of the American Academy of Family Physicians and the Georgia Academy of Family Physicians. She is also fluent in Hindi, Telugu and Punjabi. 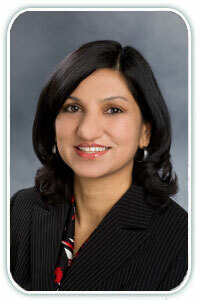 Dr. Gulati lives in Johns Creek with her husband and two adorable children.